"Two agents. One city. No merci." 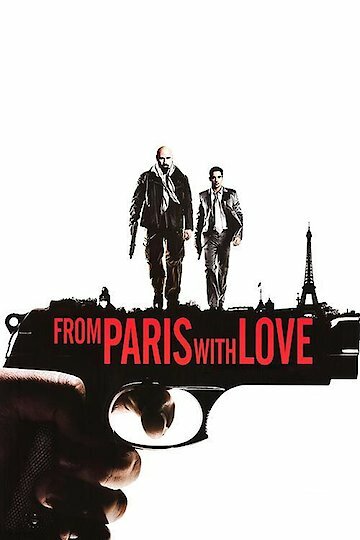 From Paris With Love is an action adventure film starring John Travolta and Jonathan Rhys Meyers. Rhys Meyers plays James, an operative in the CIA. James’ cover is to pretend to be an aid to the U.S. Ambassador to France, and to keep his cover, James enjoys an elegant lifestyle with a beautiful French fiancée and a busy social life. James is soon assigned to work with Charlie Wax, played by Travolta, to help him learn more about the CIA and to get a promotion. Wax is in Paris on assignment to investigate drug dealers that may have had a role in the death of a family member of the Secretary of Defense. The two men investigate the dealers and find that they are financed by a group of terrorists from Pakistan. The agents find that the dealers bad acts go beyond the overdose death of the family member and they have bigger goals. The terrorists are planning on blowing up the U.S. Embassy where James works. When the two agents discover the terrorist hideout, there are pictures of James on the wall. The two agents also discover the James’ fiancée, Caroline, is a double agent and is working for the terrorists. When James confronts her, she shoots him and escapes out the window. Caroline then attempts to drive a car into a government motorcade to assassinate the Ambassador. She is wearing an explosive vest. Wax blows up her car with a rocket launcher but she escapes injury. James then catches her and tries to persuade her to abandon her murderous ways. She ignores him and James is forced to kill her. The mission complete, Wax decides to leave France. He is so impressed with James’ performance that he asks him to be his partner, promoting him to a full-time CIA operative. James happily accepts and shows Wax his new weapon. From Paris with Love is currently available to watch and stream, download, buy on demand at Amazon Prime, Hulu, Amazon, Vudu, Google Play, FandangoNow, iTunes, YouTube VOD online.